Rågsved (21303) is located in the southern part of the City of Stockholm and is part of the larger bourough (city district) of Enskede-Årsta-Vantör (SDO 14). Rågsved is located approximately 12 km from the City Centre (the City Hall) and 20 minutes by public transportation (the underground). The neighbourhood is surrounded by railway tracks and a main road to the north, green spaces to the east and to the south. It is however integrated with the neighbouring residential are of Hagsätra to the west. All together, the land area (green spaces included, water excluded) is 2.06 km2. There are all in all 4 742 housing units, whereof 3 695 rental and 1 047 condominium/private ownership. There are no individual housing units, such as villas. Given its location, there is plentiful of access to green spaces and also a lake. The neighbourhood is well connected to the public transportation system thanks to the underground connection. There is easy access also the major road network. 31 December 2012, the total population was 11 620, whereof 5 712 women and 5 908 men. Since 2003, the neighbourhood has increased by 1 883 inhabitants. 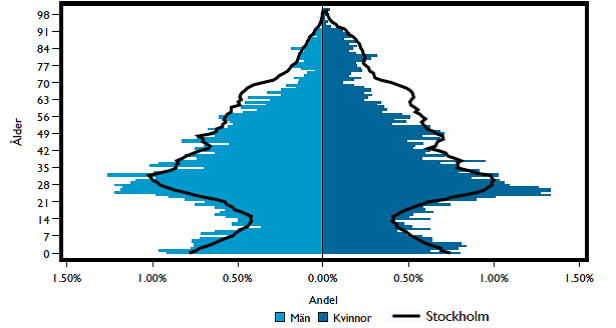 Rågsved follows the City of Stockholm cohort distribution, with fairly marginal deviations; children and especially the age categories from 25-30 is overrepresented, while those in their late 50’s up to 75 are underrepresented. Education levels are lower in Rågsved than in the City of Stockholm as a whole. It is mainly due to the neighbourhoods socio economic employment patterns, with higher proportions of residents working within the fields of construction, transportation, hotel and restaurants, health care, and lower proportions of the residents work in business services, finance, education, and ICT as compared to the overall levels of the City of Stockholm. In the former trades, formal education levels tend to be lower than in the latter ones. In Rågsved, 33.8 per cent of the residents 25-64 years old have a tertiary education, while the figure for all residents in the City of Stockholm is 55.7 per cent (ISCED 5 and 6 included). The employment rate is 63.1 per cent (66.7 per cent for men and 59.4 for women), which is significantly lower than the City average, which is 77 per cent. Unemployment rates are also substantially higher in Rågsved than in the City of Stockholm as a whole: 7.2 per cent versus 3.4 per cent. Men’s unemployment rates are slightly higher than women’s. Income levels reflect employment patterns and education levels. The average income is SEK 209 900 in Rågsved (227 400 for men and 190 900 for women), whereas 339 200 in the City of Stockholm (2011). 31 December 2012, 67.2 per cent of the residents in Rågsved had a so called foreign background, i.e. either born abroad or born in Sweden with both parents born abroad. Of the residents with foreign background in Rågsved, almost 2/3 of the residents are of either Asian or African descent. The largest foreign born groups are: Iraq, Poland, Afghanistan, Bosnia and Hercegovina, Ethiopia, Peru, Somalia, Chile, Finland, Eritrea, and Iran. 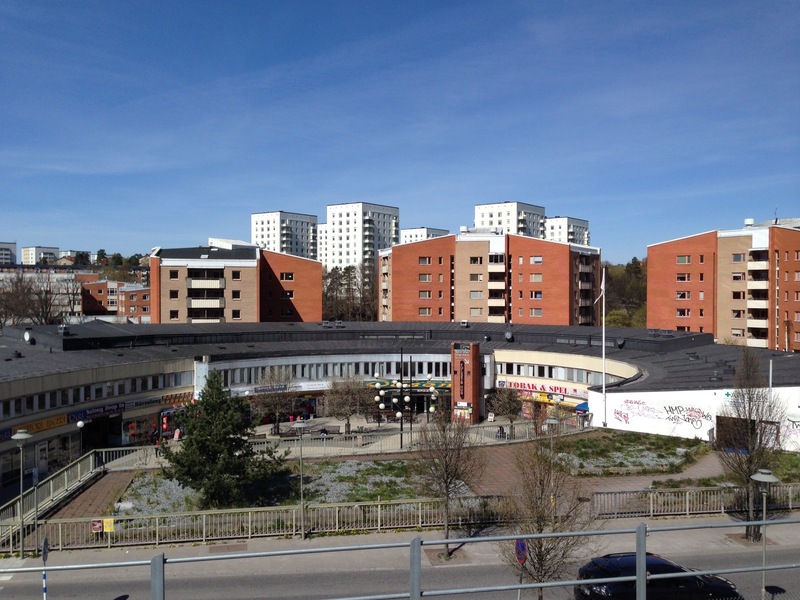 In 2012, 2 143 individuals moved in to Rågsved, and 2 127 moved out of Rågsved. Just about 50 per cent of these movings are registered as movements inside the City of Stockholm, i.e. from or to another neighbourhood within the City of Stockholm. Direct international movements are few: 8.9 per cent in movers, and 3.1 out movers respectively. The City Council has adopted a vision for Söderort 2030, which covers the entire southern part of the city including the districts of Enskede-Årsta-Vantör and Skärholmen. It is based on the city’s vision of ‘A world-class Stockholm’. Two main goals are highlighted in the strategy. The first is to improve the connectivity through better cross links within Söderort. The second main goal is to create more workplaces in Söderort. In recent years the number of homes in the area has increased, but the number of workplaces has not increased proportionally. The City aims to reverse this trend and attract more workplaces to Söderort. This reduces the need for long commutes, improves the environment and lays the foundation for a better quality of life.